Prime Minister Benjamin Netanyahu has spoke in New York ahead of his talks with US President Donald Trump. 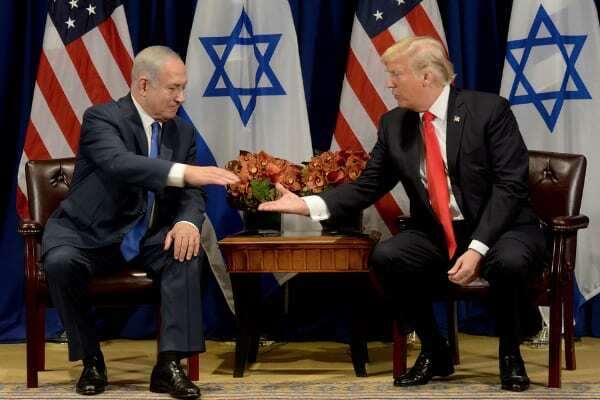 Prime Minister Benjamin Netanyahu said of Donald Trump: “I want to say that under your leadership, the alliance between America and Israel has never been stronger, never been deeper. I can say this in ways in people see and in ways that they don’t see. So I want to thank you for that. Equally, I look forward to discussing with you how we can address together what you rightly called is the terrible nuclear deal with Iran and how to roll back Iran’s growing aggression in the region, especially in Syria. As you said, we will discuss the way we can seize the opportunity for peace between Israel and the Palestinians and between Israel and the Arab world, I think these things go together and we look forward to talking about how we can advance both. Finally, we’re going to be speaking tomorrow at the UN, and I want to say that under President Trump, America’s position towards Israel with the UN has been unequivocal; it’s been strong; it’s got both clarity and conviction. And I want to thank you on behalf of the people of Israel and Israel’s many friends around the world.